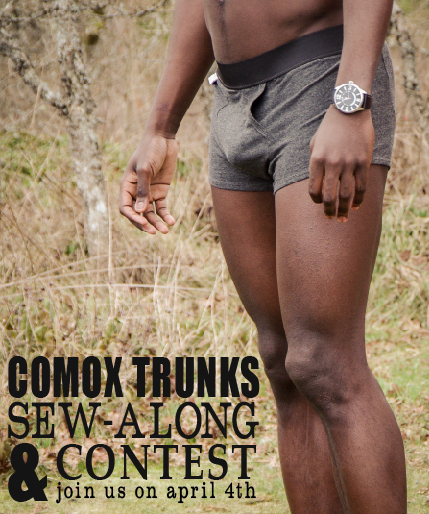 Note: Now that I've told you the good news, I have a slightly less thrilling announcement about the Comox Trunks sewing pattern. It has come to our attention that there was a minor error involving pattern pieces 2 & 3. We will be revising the PDF pattern shortly and will email it to everyone who has purchased it. For those of you who have purchased the tissue pattern, please refer to our Errata page on our website and please don't hesitate to ask for clarification while you sew (simply email us at info@threadtheory.ca). We're really really sorry about this error - we will be providing several easy cutting and sewing methods throughout the sew along for you to use if you have purchased this edition of the pattern! Awesome :) I look forward to seeing your trunks!